LAST CHANCE: Enter Inhabitots’ Back to School Giveaway to Win One of Three Backpacks Filled with Green Goodies! 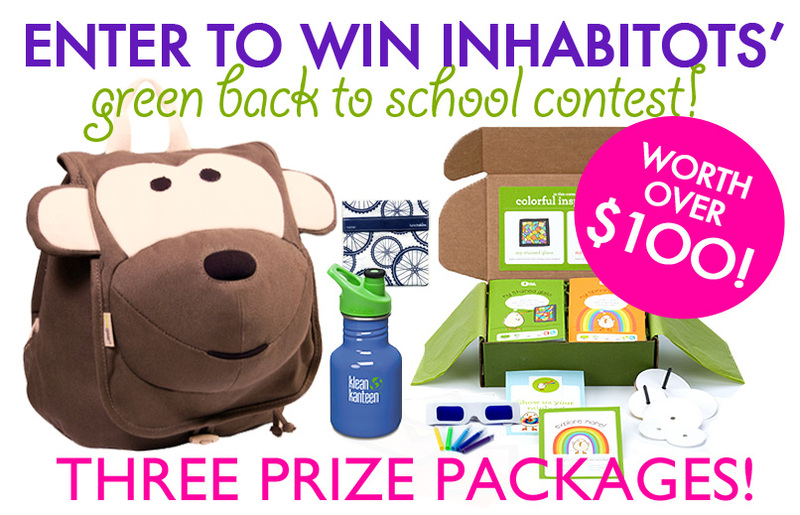 It’s time to send your kids straight to the head of the class with Inhabitots’ green back to school contest! We’re giving away THREE adorable EcoZoo backpacks brimming with eco goodies valued at over $100, to teach little ones a lesson in sustainability. Get your child off to a great start of the school year with a Klean Kanteen stainless steel sport bottle, LunchSkins reusable sandwich and snack bags, and a colorful, all inclusive art and craft kit Kiwi Crate that will encourage his/her creativity. …if you haven’t already! We’ll be notifying the winner in Inhabitots’ newsletter – so you need to sign up and receive our newsletter to find out if you have won. 2) Like Inhabitots on Facebook & The Ultimate Green Store on Facebook. Tell us how you plan to green your child’s back to school routine this year. Contest ends TODAY September 19th, 2013 at 11:59 p.m. EST. Winner will be announced in our newsletter on September 20th, 2013. Good luck! Win one of three adorable EcoZoo backpacks: the Monkey, the Puppy or the Pig. 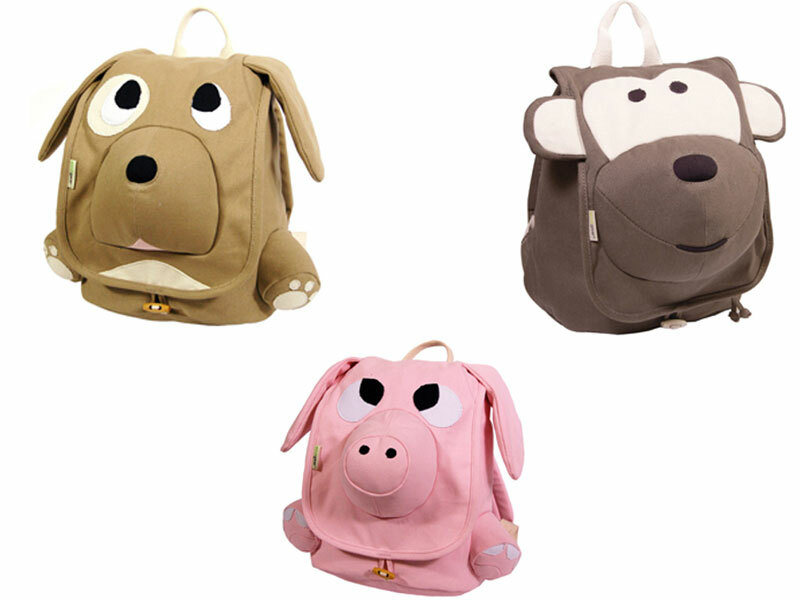 Part carryall, part toy/lovey, these backpacks are PVC-free, and made from natural cotton canvas and rope materials. Their buttons and buckles are made from recycled plastic and sustainable wood. All colored materials used in the construction of these backpacks are treated with toxic-free dyes. Every kid needs a great reusable water bottle and you can’t beat Klean Kanteen. These 12-ounce bottles are made from high-quality, 18/8 food-grade stainless steel that’s totally free of BPA and other toxins. 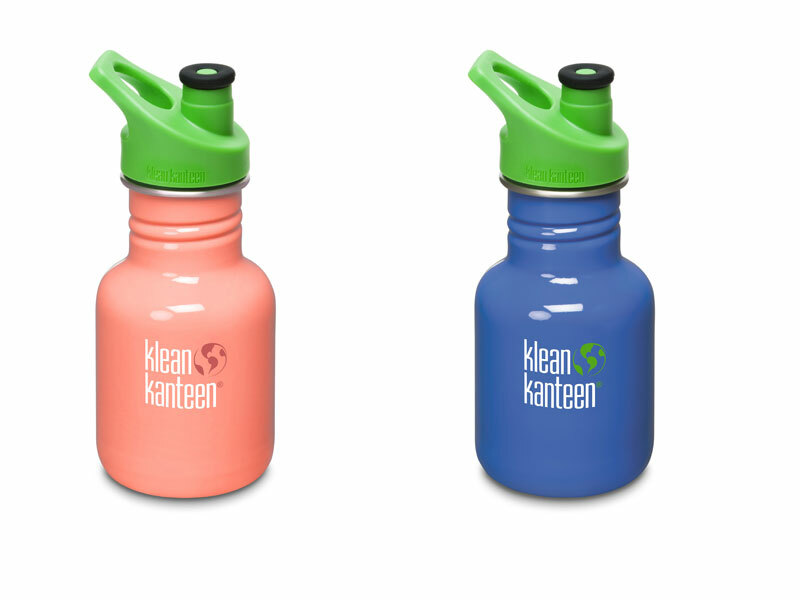 Because stainless steel itself is safe, Klean Kanteen doesn’t coat the inside of their bottles with a plastic or epoxy lining, and these sport bottles won’t leach toxins or flavors like plastic bottles tend to do. The cap is also BPA-free, durable and boasts a noise-free relief valve — no chirping or whistling! 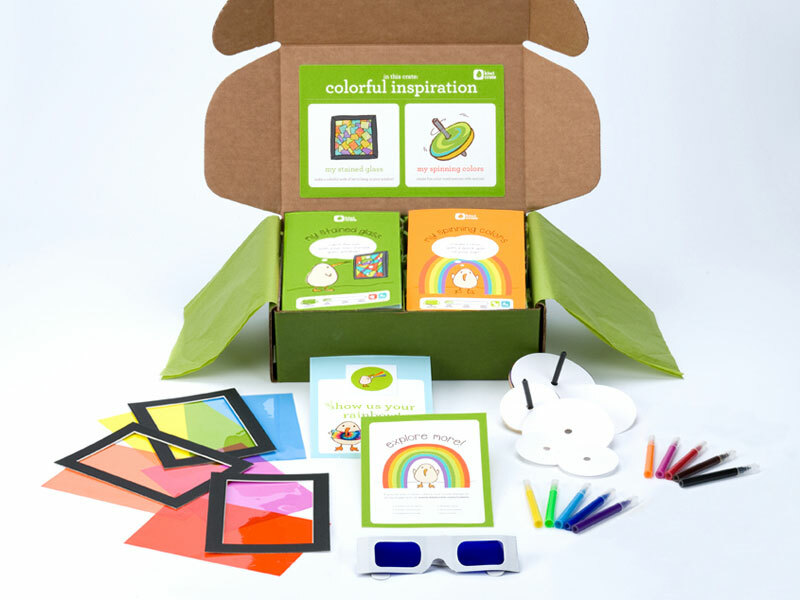 The Colorful Inspiration Kiwi Crate lets kids explore the world of colors. Make a stained-glass window, create colors with a quick spin of your top, and dye a tote bag using colored tissue paper! The award-winning Kiwi Crate delivers monthly hands-on projects that are tested and proven to inspire curiosity and learning, right to busy parents’ doors. Each crate includes materials and inspiration for 2-3 projects, and each project is designed by parents, reviewed by child development experts and tested by kids. 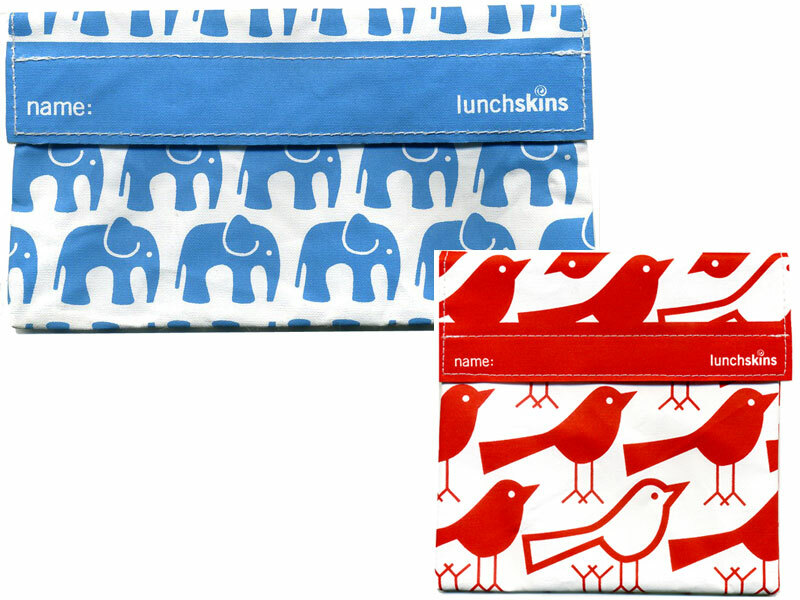 Each of the three winners will receive a reusable sandwich bag and a reusable snack bag from LunchSkins. We love the clean graphics, modern, vibrant designs and the simple lines on these sweet bags which were created by three green-minded mommies. The lightweight, food-certified cotton is hand-sewn and printed in the United States, and the bags are lead, BPA, and phthalate-free as well as being grease-proof and moisture-proof. Lunchskins are dishwasher-safe and their durability means that hundreds of plastic bags are saved whenever you use one. Contest ends TODAY Thursday, September 19th, 2013 at 11:59 p.m. EST. Winner will be announced in our newsletter on Friday, September, 20th 2013. Good luck! I'm using re-usable snack bags in my kids' lunch boxes this year as well as giving them lunch in glass containers, not plastic. I have also planned to make healthier homemade lunches for the kids this year compared to just giving them processed foods from the store. We're also setting up a recycling bin in our house to recycle any paper/projects that come home from school that would otherwise go in the trash. Hopefully, these small steps will encourage my kids to think green in the future and help save the environment!! I plan to try to avoid disposable materials as much as I can. We have been using Klean Kantees for awhile now and even though they are knocked about, they still look great. I am using wax paper instead of plastic wrap for the pre-made frozen sandwiches. Getting my boys a GREEN start to the school year included planning and planting an organic veggie patch at their school, writing an article "it's easy being green" for their school newsletter with lots of great, simple and cheap ways of keeping our kids 'footprints' small, looking for Eco friendly lunch boxes etc (that's how I found Inhabitots!) and most importantly making sure my boys have a love of nature and the great outdoors through lots of time in it and lots of books about how they can play a positive role in looking after the planet. Doing my best to raise Eco warriors! My mom always gives me healthy lunch to school. She cooks only from organic products. And she puts it in a nice container, and a lunch bag that i use for a year and a half already. The only thing i'm missing is a bottle)) And the bag i would give to my younger brother, he is 4. I am 10. We'll avoid plastic this year! My 3 year old son would love this for his dayschool! What great companies and such great products! Im trying to cut back on our plastic use and waste. Thanks for this opportunity to win this my great niece would love it! Thanks for the opportunity to win. My daughter is currently waitlisted for pre-K (she's 2y8m old) and could not be more excited to start school. She already uses my Klean Kanteen, so winning one for her would mean I could have mine back!!! We live in a small town that isn't very eco-conscious, so we intend to go as green as possible in her (first not back-to-) school routine. Bento boxed snacks/lunches and eco-friendly supplies! The first day of school is always exciting! The time to eat is a time to socialize and to set a good example to classmates. Healthy food and colorful, fresh vegetables and fruit for a snack! Using only silicon containers (glass is a big responsibility for a child) to respect the environment. With a kit like this to go to school will look like a prize! Our family plan for back-to-green this year include: our new backyard herb garden (with our own compost!) and the increased recycling and homemade lunches for the kids in reusable containers. We are very excited about our new changes. Adorable! I've been looking for a good stainless steel sippy for my kiddos! My son won't be starting preschool til January. We try to buy all of our organic produce and meat from our local farmer's market. We also use reusable snack bags!! We are packing REusable lunches... lunch box. food containers, water bottles... no pre-packaged food. We are using reusable lunch boxes, food containers, water bottle, and cloth napkin. Always looking for more ideas! We are getting rid of all plastic in our kitchen, including lunch box food containers. We started homeschooling for my son's second grade year. We use less gas, use recycled materials to both teach and supplement, we use the iPad and dry erase boards instead of paper, and we especially integrate environmental studies along with character building and Bible study as a top priority! We are ridding our kitchen (including food containers) of all plastic. I've been using reusable baggies instead of plastic for most things. And I got her a stainless steel box for other foods. We have totally reinvented our school routine this year! This would fit in perfectly. We have removed all plastic from our home, buy only organic and GMO free. It is crazy when you see all the toxins wel allow in the USA! It is so swesome to get my kids 9,7, and 4 in on reading labels and growning our own food. We are LOVING it! Thank you for all you do! I plan to use reusable plastic bags and containers! This is our child's first full-day schoolyear, so we're still perfecting things. She takes a healthy lunch (with foods from our organic garden when possible), with reusable, BPA-free containers; makes as little waste as possible; and we compost the leftovers. We also recycle. She also uses "public transportation" (the school bus) so less pollution is made and fewer fuel resources are needed. Thanks for the chance! By using less plastic, and I've always tried to stick to the reusable & BPA-free containers just because it's healthier for my daughter. Our 3 year old started Montessori preschool this year. As a family we do local food as much as possible, and we do litterless lunches - stainless steel snack containers, reusable snack bags, and a stainless steel water bottle. All leftovers and food scraps are composted. We walk to and from school (while I babywear my youngest) so that's another way we're green. At her preschool, they recycle and do environmentally focused activities as well. Definitely reusable lunch bag with reusable containers. We love stainless steel bottles! We're switching from ziplocs to reusable snack bags and also trying to be more mindful of portion sizes and leftovers to reduce food waste. Hi :) I like the prize packages and I am going green with myself and the kids! Very important and a very good side :) Keep it on. Have a happy and green life you all. Living a green lifestyle has so many components, it has taken our family years to replace conventional products and appliances with greener choices. I've been teaching my son how to garden, save seeds, and compost our food scrap to save money, eat healthier, and give back to the earth. He loves to help me do laundry, we use green detergents and a clothesline. Children need to be taught at an early age to be practical with resources and choose sustainable things whenever possible. We pack lunches with reusable containers and use washable cloth napkins to reduce waste, which is why I love the idea of this lunch bag! Everything can be enjoyed over and over again, and the brands support a great cause! We are doing a waste free lunch. As of now, we're washing and rewashing sandwich bags. We then hang them to dry over the knives in the rack...the knives we use daily. This is another way of saying there's a bit of interference and a lot of complaining! Using toxin-free, sustainable materials would help to break these acquired habits that are mindlessly wasteful and harmful. Luckily, these are the changes that children remember and rarely reacquire. Also, we think the silicon spout on the Klean Kanteen is a great idea. Thanks! We are using reusable sandwich/snack bags and reusable containers for fresh fruits/veggies. We use clothed backpack, and natural foods, thanks for the opportunity. Gonna pack the rest of the summer garden into their lunch's. Send water in their glass containers. Have to chat about what else they want to incorporate into the winter garden, have already planted peas and lettuce. Ask them to take out the compost and help making the compost tea. Get help with hanging out the laundry and bringing it in. Am looking at which cloth diaper is superior and easiest for her bros and sis to change for my little pumpkins bottom. Encourage every other day showers and co sibling showers. Try to talk about what I am learning in my environmental studies courses for the day and ask for their input. Listen to their stories about their latest car designed to run on water. Love the great ideas in the other comments!! Gonna try out some of those too. We are using reusable lunch bags and sandwich containers. My kid has dinged 3 kleen kanteens to a leaky DEATH already, lol. I finally made a wool sleeve from an old sweater I felted in the wash. Keeps the flask from sweating all over lunch too so double bonus. We've got a whole bunch of non-disposable, non-plastic travel food gear already but with 3 people taking lunches I still run out of containers. I'd love some more, I make very good use of them every day. We are using reusable items as much as possible. The idea is that nothing will be thrown out from lunches. If the kids bring home leftover food, we compost it or feed it to the chickens. My daughter would absolutely love the kleen kantene as she has encouraged our household to recycle and i myself have been interested and recently active in green products and building. Adding organic fruits to lunch is how we'll begin our back to school green routine. The only way forward, if we are going to improve the quality of the environment, is to get everybody involved. This is a wonderful way to start. I'm reusing food wrappings paper, plastic, aluminum. I am going to win this backpack and then my baby will be all greened and ready to go! At home we recycle & have composted. We also use reusable bags and bottles. We are lucky enough to live in a community that is BIG on being green. So we have a lot of programs in place that allow us to recycle & compost, grow our own veggies in community gardens & ride our bikes everywhere. My son's school even composts & recycles. We use reusable containers, and a ss water bottle. My kids also get lots of home grown veggies in their lunch, and they bring home anything they didn't eat and compost it rather than throwing it out. Thanks for the chance! Not seeing my post, so trying again! We use reusable containers, and a ss water bottle. My kids also get lots of home grown veggies in their lunch, and they bring home anything they didn't eat and compost it rather than throwing it out. Thanks for the chance! Ack, so cute! It's all SO CUTE! We are using stainless steel water bottles and stainless steel tiffins for school lunches this year. My kids have been back in school since July and I'm pretty certain any lunches/snacks I've sent since then have been entire waste-free. This prize pack would be great for my youngest little guy, who could use this when we have mommy-toddler adventures out and about. :) Thanks for the chance! We plan on making sure my daughter eats as much organic food as possible this year and travels to and from school via bus, bike or foot! I have been sending my child a reusable water bottles, plus sending their lunches in an environmentally friendly lunch box. My son will be the hit of the lunchroom and make an impact on the environment at the same time. With the hectic morning routine, this will help streamline the process. We will not only be using this for school lunch but also for our weekend picnics and hikes. We can't wait to show off these wonderful products. 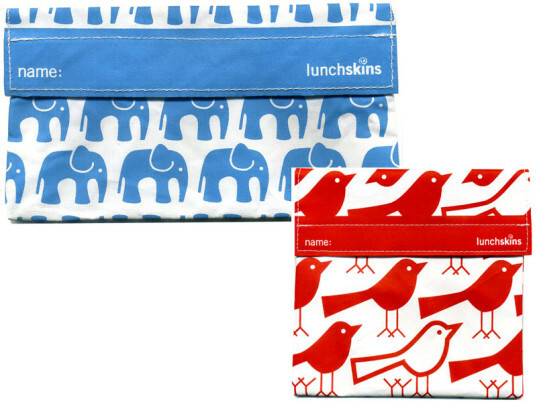 Use a thermos and resuable sandwich bag for lunches! We are using think sport stainless steel canteens for drinks for recess and lunch, reusable snack bags for snacks, reusable cloth napkins and lunchbot containers in a reusable lunch box. We eat organic everything, compost what is not eaten. Oh and we don't buy anything individually wrapped because it creates more trash. Thanks for the opportunity! Hey inhabitots. I plan on "greening" my child's back to school routine this year by using ziplocks. Yes, they are not a number one healthy option, but we can't aford reusible bags, so it's a step forward, than buying procesed food at school. The food although will be bio as much as possible, that's why we would love wining the reusible bags and containers. There's probably not a better way to teach reuse and sustainability than with cute totes and bottle. As every kid, my son's wild imagination suggested us something great. He suggested that we make him food containers out ot... food! At first we laughed and took it as a joke, but after rethinking it, we decided to give it a try. If Hansel and Gretel lived in a yummy house, why couldn't we make yummy back to school food containers? We made a couple of small lunch boxes out of coconut shells! Also made a diy backpack out of old t-shirts from organic cotton, and used nontoxic paint to decorate. We loved our green ideas, but the coconut food containers only lasted so much. They spill a lot and cause big messes. That is why we would love to change them with reusable bags and ad an amazing nature in favor backpack! I am trying to choose reusable products for my son's lunches and when it's my turn to take the class snack. I love the idea of using the stainless steel bottles as well as reusable bags. I plan to use reusable containers for Lily's lunch and to discuss with her the importance of protecting our environment. I think it is very important to instill this information as early as possible in our children and grandchildren so that it becomes second nature for them to "think green". LAST CHANCE: Enter Inhabitots' Back to School Giveaway to Win One of Three Backpacks Filled with Green Goodies!